The border crossing from Georgia to Azerbaijan has been built up as the first of the difficult ones. A nightmare of kafkaesque paper work, permits, stamps and hanging around. "Hurry up and wait" writ large. The sign leaving Georgia didn't fill us with confidence (see photo). The border guards were conscripts doing a year in uniform before getting on with their studies. One lad was more interested in how to get onto an MA programme in England than checking our papers. We had an interesting discussion about whether Nagorno Karabakh belonged to Azerbaijan or Armenia. The correct answer is Azerbaijan and luckily that is what my map showed. 15 minutes of hanging round and we were allowed through to passport control and customs. The inevitable cry of "Documents. Passport" and we were ushered to the window one at a time. 5 minutes and we were done. The threatened entry tax (known as "insurance") was no longer needed and we were through. It seems that since GB were here two years ago it has all been computerised. "Welcome to Azerbaijan". After Georgian pine forests we were in the wide valley of western Azerbaijan. The (very uneven) road arrowed eastward between avenues of whitewashed tree trunks. Wide grass verges kept the sheep herders off the carriageway. Their large flocks of sheep and long horned goats were led by a pack donkey and followed by roaming sheepdogs. We have stopped for the night in the small town of Shaki before a run down the Bakku tomorrow to find a ship that will take us across the Caspian Sea. Exciting! Pleased to see your internet connectivity is still holding up. Also glad to hear that despite the presence of (sheep)dogs you haven't been beaten by one yet. 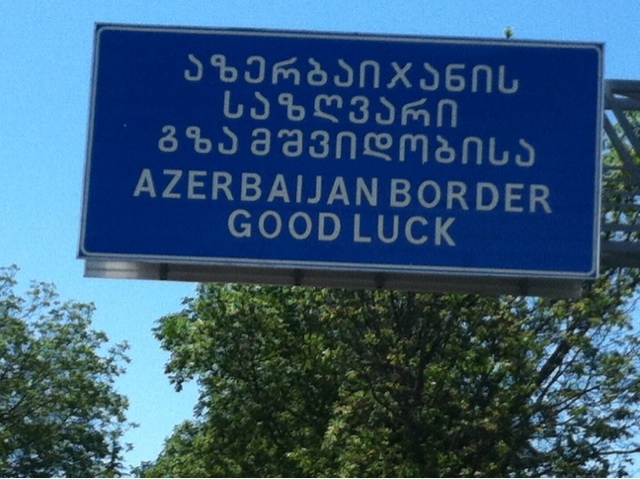 7AS from EWS South ask if you were scared when you saw the sign and have you learnt any Azerbajani? Many Thanks to all the Base Groups posting the outlines of their projects!!! Enjoying your blogs and places you have seen, so we are to join you on your dream. We will make our own silk road and in our presentation, we will take a look at some different cultures and foods they cook. As we explore along your route we will have challenges just as you but remember that life is what we make it, so just dare to be great! We are doing our own blog about how great it is to follow your dreams and expore life to its' fullest. As we dig deeper into the wildlife we will know why it is so important to challege ourselves. We are also doing about the roads which will give you more understanding of the world around us and give us education which is for life. We hope you do great in your journey and will follow you the whole way. Enjoy living your dream. 7BK (EWS South) are excited to start researching the countries along the Silk Road route. We have split up into different groups and look forward to finding out more about other cultures, especially whether students in other counties have the same opportunities at School as we do. We will be using all of our talents to create a truly individual final presentation. Good luck with your journey, and remember- life is what you make it! This is a very challenging journey inspiring others to follow their dreams and ambitions in life. Our project will include how you do the journey including the bike, before you set off, famous sites on the way and any problems to overcome whilst on the road. We are a dynamic form from EWS south site (8JT)with a huge passion for food. We are investigating the foods along the Silk Road route. Whether it’s a chicken fried rice in China or a tabbouleh from Iraq, we will be testing the culinary styles of all your countries. For our project presentation we are all contributing to create a successful presentation. Members of 8TD have chosen different areas and aspects of the silk road route and project. Our aim is to make this presentation as interactive as possible and therefor making it interesting for our audience. We are completing a scrap book to remind Steve of his journey and the sights/wildlife he has seen on the way. The form is divided up into groups to work on different areas of this exciting trip.